As Colleen and I (Heather) retire and step down from BWI of Chicagoland, we’ve both been reflecting on what a phenomenal journey we’ve been on, from learning to use our first carriers, to learning to wear toddlers and preschoolers, to learning to spread the love, and meet so many new and veteran caregivers along the way. I am forever grateful and appreciative of Colleen and Hyacynth (our other leader from Lake County, when I learned of the group). I found them when I had a 2 year old and newborn. 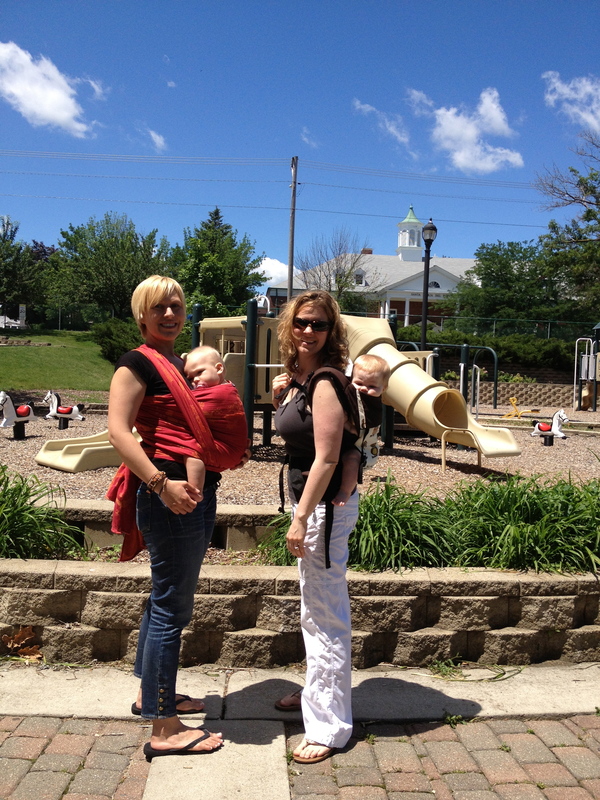 Colleen and I both started using carriers around the same time (8 years ago, if you can believe that!! 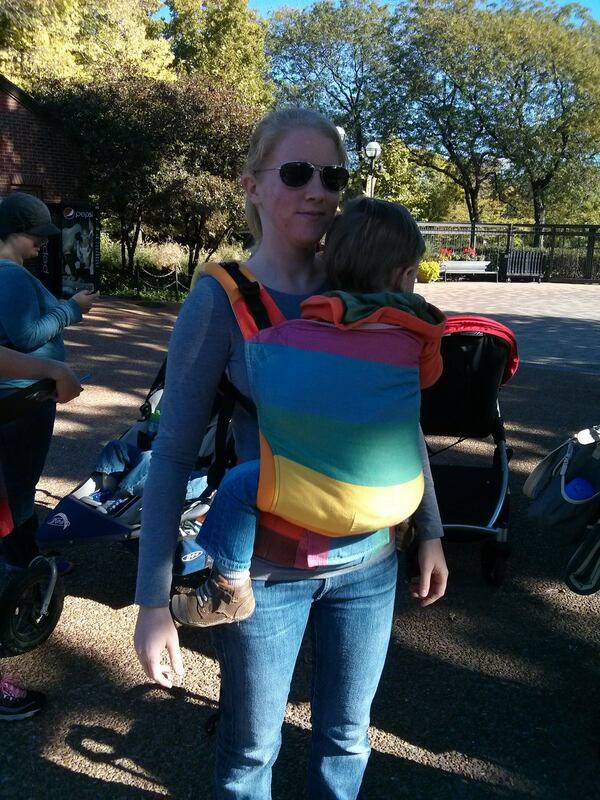 ), but all I had experience with was my Baby Bjorn and an awesome ring sling. 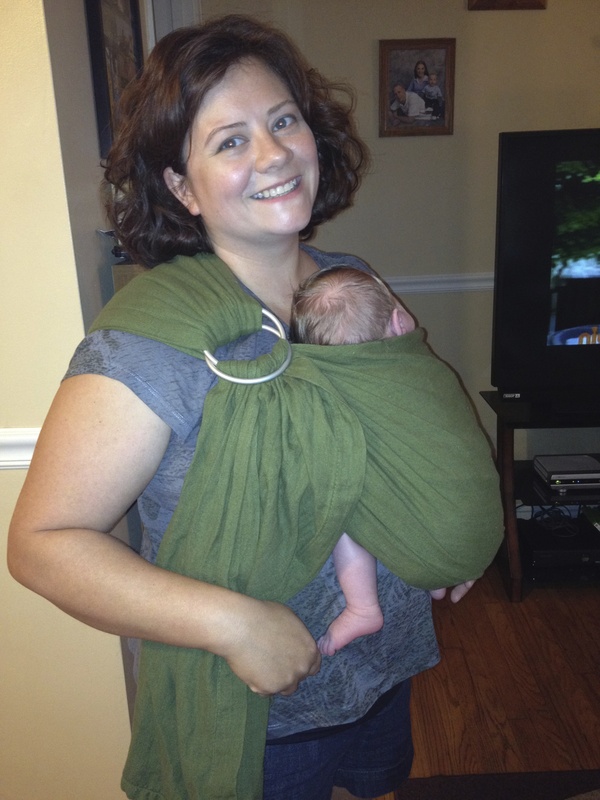 Colleen learned about different carriers through our local La Leche League, before her first was even born! 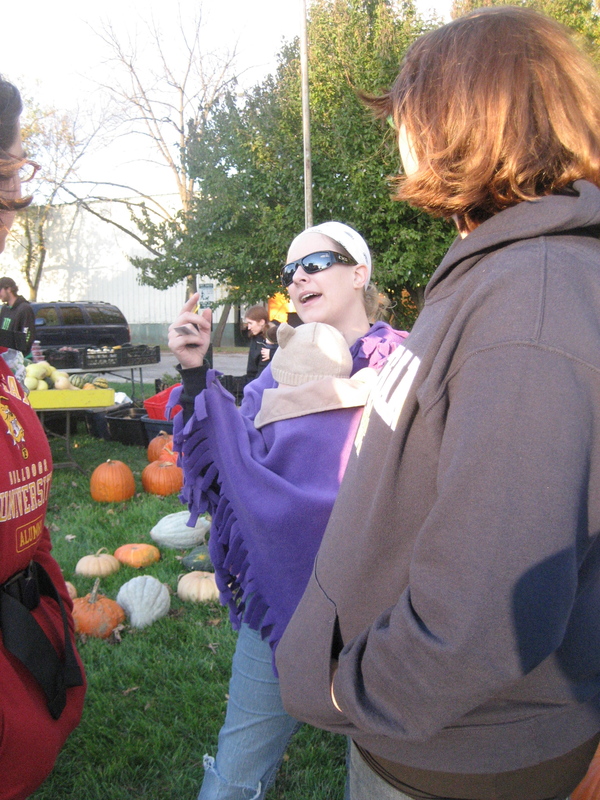 She then found the local Lake County group through an online forum at thebabywearer.com . Helping teach others was a calling for her. When I met Colleen and Hyacynth, they were warm, welcoming leaders for the Lake County Babywearers, and had group gatherings I wanted to keep coming back to. That was almost 6 years ago! Colleen was my inspiration, and she pushed me beyond my comfort level. “You want me to try this long piece of fabric?” “Are you sure he’ll be ok on my back” (remember I had only used a ring sling and Baby Bjorn before this…). THANK YOU COLLEEN. Back then, we were a small group, with around 30 attendees online (and maybe 10-15 adults total in person each month?). It was a social group, and very much about wearing all the babies! There weren’t nearly as many carriers or brands of carriers out on the market. I will always think fondly of my early days learning from so many women I consider great friends to this day. We’ve both grown as educators, parents, and friends. The organizations have had tremendous growth as well over the last number of years. But now, our kids are growing up, our lives and passions as parents have changed focus. It’s time for us to find some new adventures! Sometimes caregivers will thank us, but we really need to be thanking all of you! It was all of YOU that kept us coming back meeting after meeting, month after month, and wanting to spread out more, and stretch ourselves as a group. 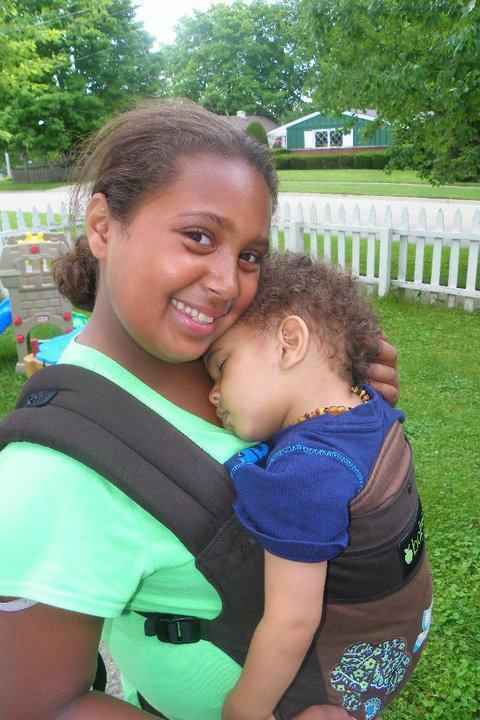 To meet more of you, and share what we’ve learned about wearing our babies close. The years have flown by. This volunteering journey and the people we’ve met have changed our lives, so thank you for that as well! You ALL drive this group. You help each other socially, through questions, and support on the off topic facebook chat group. You help each other learn about carriers, carries, and support each other in the local BWI group, at meetings, and playdates. The group will continue to thrive because of ALL OF YOU. If you see a post that you can contribute to? Share what you’ve learned with others. That’s how all of our past and present leaders learned along the way. 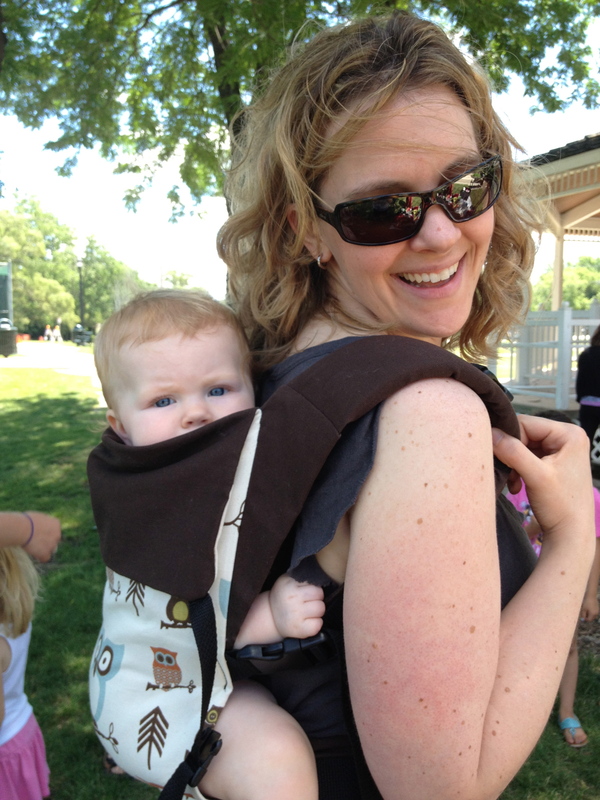 We love how the current and future leadership team has such passion, excitement, and “fresh eyes” to share babywearing. Their ambition and passion will serve the Chicagoland chapter well, and I’m sure they will make great, positive changes in the future. I’m looking forward to hearing about the things they accomplish that took a back seat during our tremendous growth. They have drive and ambition, and they will make great improvements and changes for the group! Hold those babies close. They grow up WAY TOO FAST! One day (believe it or not) they’ll get too big to want to be worn. This weekend, we hope you all get a chance to use whatever carries at your disposal to enjoy time with family and friends! Happy Independence Day! Amauti Coat: (Amauti Baby) Traditional Inuit coat with a back carrier built in. Used with newborns and up. For use in winter or cold weather climates only. Beautiful, expensive, and custom made. These only do back carries. Rebozo: We see these sometimes at meetings. These are a traditional Mexican shawl that doubles a a hammock, baby carrier, backpack, or whatever is needed. 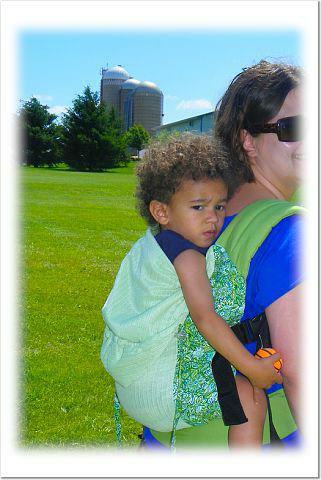 A rectangle of woven fabric, when worn with a child this carrier is knotted over one shoulder to work as a sling. 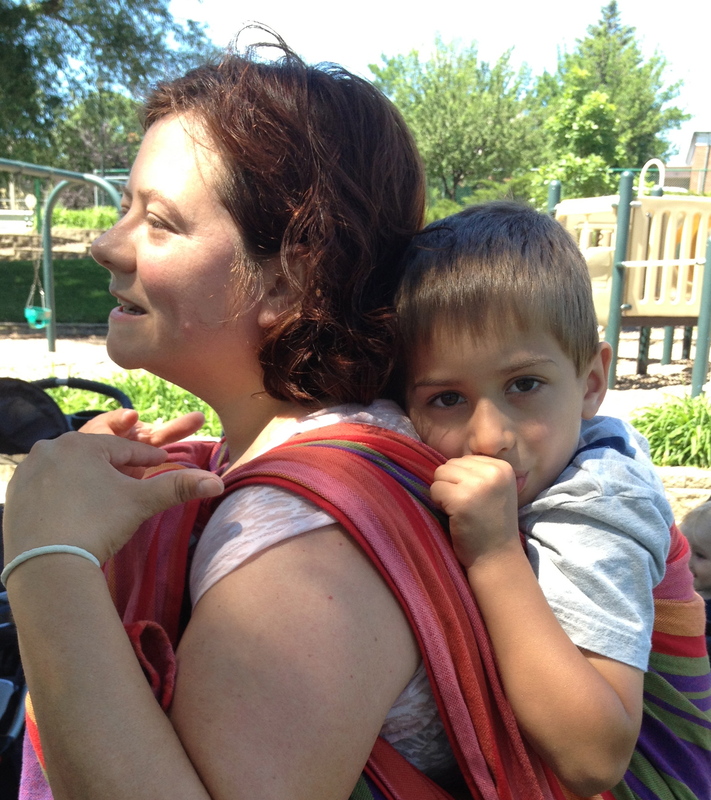 Some people purchase short woven wraps with the purpose of doing a Rebozo carry. Frame Backpacks: (Kelty, LittleLife, Deuter, Osprey) for the outdoorsy family, framed backpacks protect the baby from harm. They are comfortable for a day of hiking, and often sold at sporting goods stores. Use with older babies and toddlers. Interior frames (with the frame inside the material of the backpack) are becoming more popular than exterior frames. These tend to fit people with longer torsos better than people with shorter torsos. Soft Unstructured / Asian Style Baby Carriers: A rectangle or square of fabric with ties that secure baby to you. These are unpadded and not structured traditionally, however western customization can make for more variations. Easily adjustable to different wearers. Mei Tai (pronounced “May Tie”) is popular, others include Hmong, Onbuhimo, Podaegi, Chunei, and Bei Bei. Mei Tai: (Catbird Baby, BabyHawk, Kozy) an easy to use Chinese carrier for all different ages, comfortable for short or long term carries. An unpadded waist strap is a plus here, the bottom can be rolled up to make a smaller body size to fit a younger infant. Podaegi: (FreeHand) A Korean carrier that is traditionally worn on the back. It is basically a blanket with a long strap over the top. The strap goes over the wearers shoulders and back under the baby’s bottom. It is used for newborns and up. Narrow blanket Pods have become more popular in the west because they tend to be airier. Onbuhimo: (FreeHand) A Japanese carrier that is very similar to the Mei Tai, except, instead of bottom straps it has two loops that the top straps are threaded through. Soft Structured Carrier (SSC): Easy to use and position baby. Great for travel, can be used from birth until toddler depending on the carrier. Often padded for greater comfort. Usually uses buckles or snaps to secure baby safely. Easily adjusted between wearers. 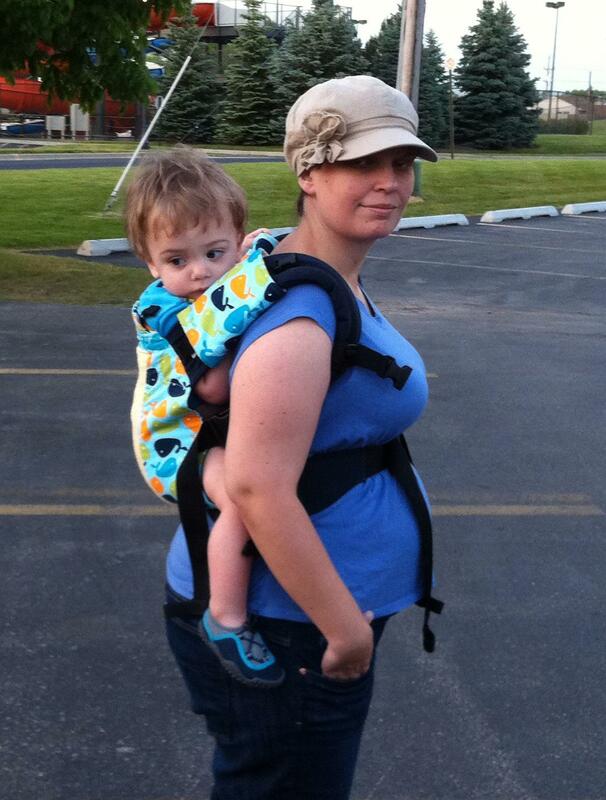 Front pack: (Bjorn, Britax) A usually front only carrier that does not use an ergonomic seat. Better for short periods of wearing with smaller babies. Structured Hip Carrier: (Scootababy, Mei Hip) A carrier for parents and babies who love hip carries. Structured with one shoulder strap. For babies 6mo+. These can also be used on the front or back, but they do hip carries the best. 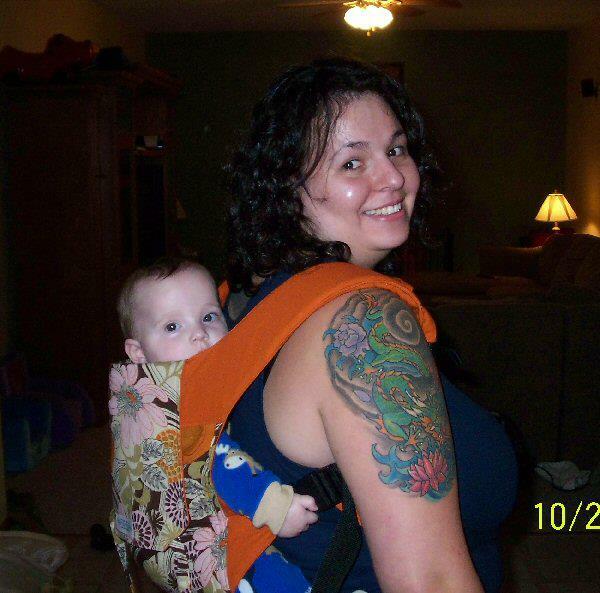 Ergonomic: (Ergo, Beco, Boba) A front/back carrier that hols baby in an ergonomic position. Best for older babies and toddlers, although can be used with younger infants with an insert). Comfortable for both baby and wearer, these can take the place of a framed backpack. 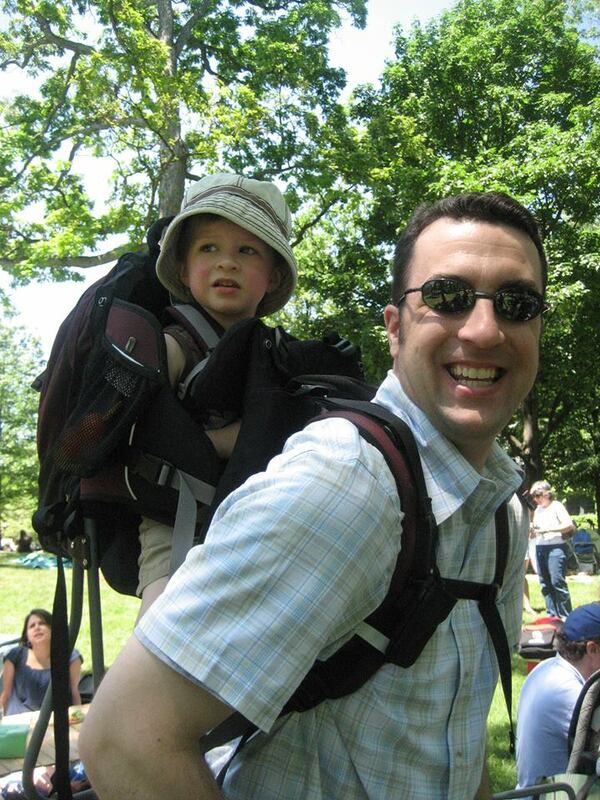 Men tend to prefer these types of carriers because they work more like a backpack. Pouch Sling: (Hotslings, Slinglings) A loop of fabric folded to create a pouch. Easy to use, but sized by the wearer, so they cannot be shared between caregivers unless everyone is the same size. Not great for newborns. Bag Style Pouch: (Premaxx, SlingRider) NEVER USE with babies – babies have died in this type of carrier, giving all carriers a bad name. These carriers are non-adjustable pouch slings with elastic edges and a deep pouch. They lay very low on the wearer’s body, certainly not keeping baby “close enough to kiss.” The deep pouch curls baby’s body into an unsafe position, and the elastic edges close over baby’s head to prevent fresh air from entering the carrier. 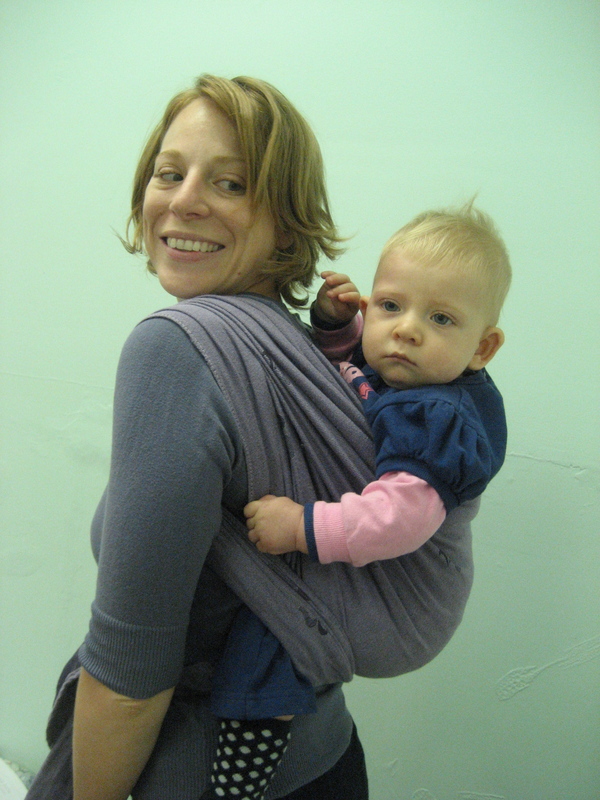 Ring Sling: (Maya Wrap, Sakura Bloom) Easily adjustable to different wearers, features a ring over the shoulder, which material is threaded through. Works well for newborns through toddlers. AKA traditional or open tail ring sling. Close Tail Ring Sling (Hava, Sling EZee): Similar to an adjustable pouch, this is a ring sling with a strap to adjust instead of the rest of the fabric. Does not adjust evenly like an open tail ring sling, and can be tricky to use with a newborn because of that. Some (like Balboa Baby) have extra padding and elastic edges that can create more slack. 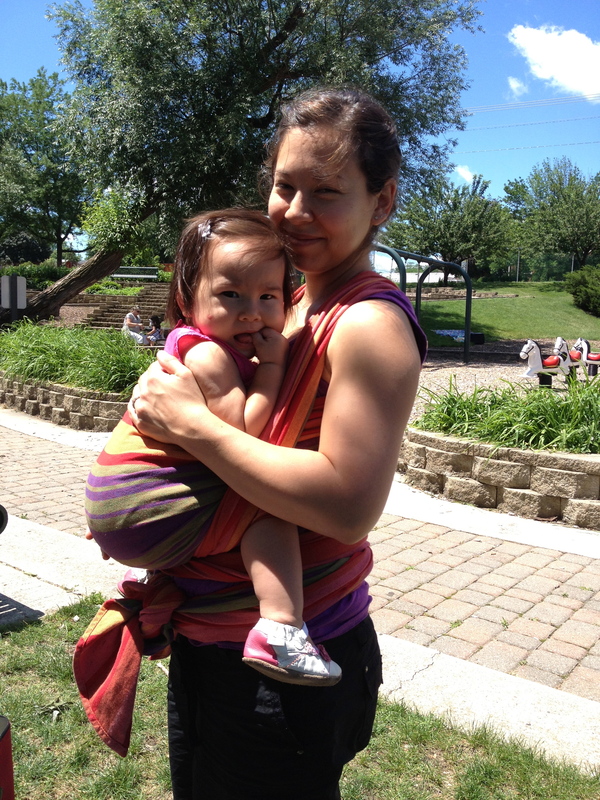 X-Sling (Cashmere Cuddles, Michiko Baby): These are not very common in the US. This carrier has a loop over each shoulder, and is sewn together in the middle. This makes an X on the wearer’s front and back. Baby is slipped in to the X for an easy two shoulder carry. Usually not adjustable. Stretchy X-Sling: (K’tan, Blue Celery, Caboo) Like a X-sling, except that the material is stretchy. These can be used to hold one or two babies. Holds baby like a stretchy wrap without the tying. Great for newborns, generally too stretchy for older babies and toddlers. Most brands are not adjustable. 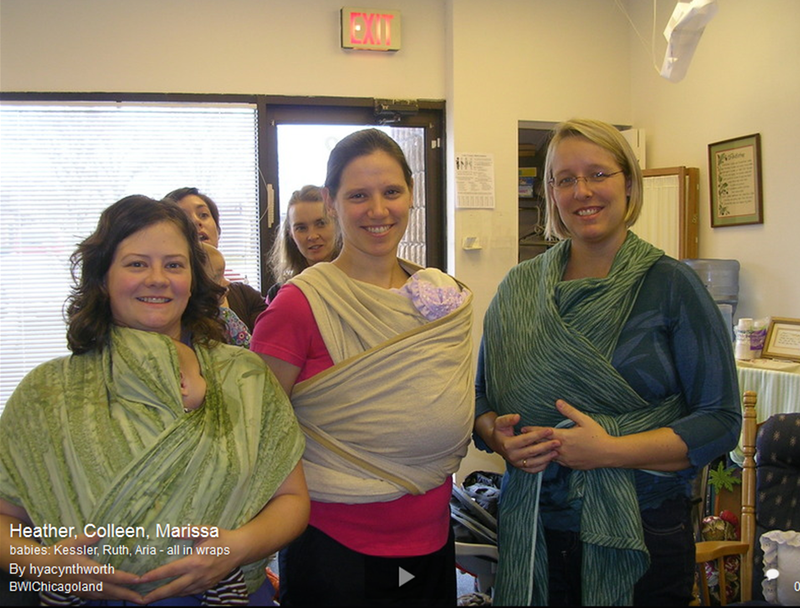 Wrap/Wraparound: a long piece of fabric that is wrapped and tied around the wearers body. Baby is slipped into the fabric for a secure hold. Distributes weight evenly for long carrying. From birth until 40lb +. Easily adjusted for different wearers. Can carry two babies at once. 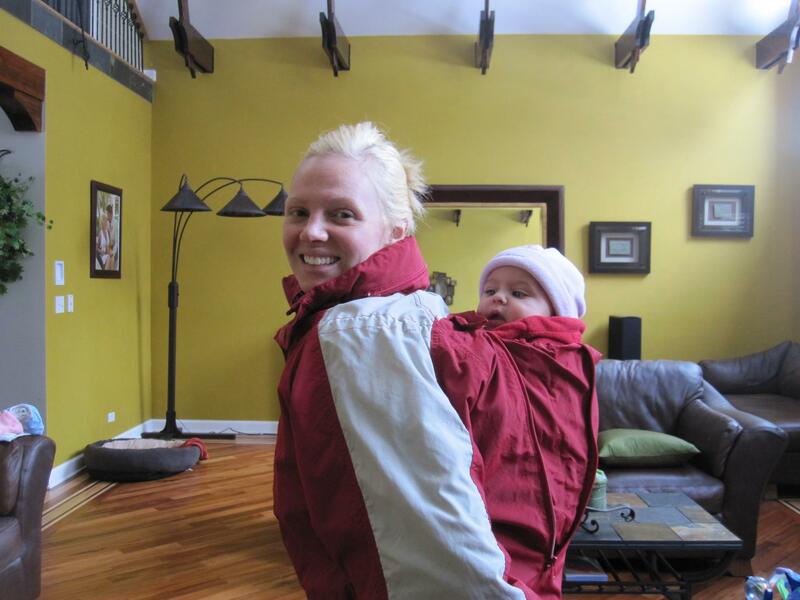 Stretchy: (Moby, Boba) A carrier made of a length of 4 way stretchy fabric. These ones are popular and easy to adjust, great for newborns. They tend not supportive enough for older babies and are hot in warm weather. Front and hip carries only. Hybrid Stretchy: (Wrapsody) A stretchy wrap with 2 way stretch. Tends to be more supportive than a normal stretchy, and can do back carries. These can be slightly diggy though and require more precise wrapping. Simple Piece of Cloth: Exactly what it sounds like, a sheet, blanket, shawl, or length of fabric wrapped around wearer. As long as you test the seams and body, then it is perfectly safe for baby. DIY Wraps: Pieces of fabric, often Jersey, Osnaburg, and cotton jacquard, that are cut and hemmed to a babywearing wrap size. 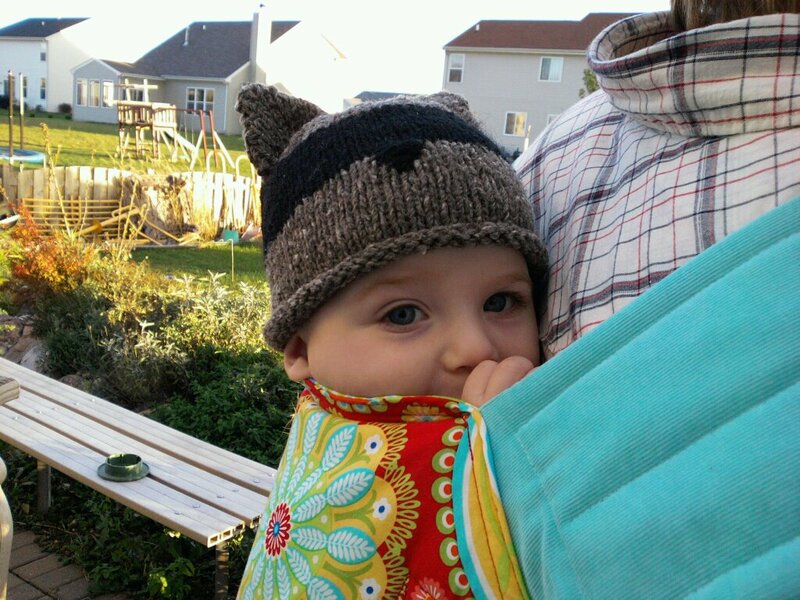 Woven: (Didymos, Storchenwiege) If you were going to have only one carrier, this would be it. Woven carriers are stronger than stretchy ones, meaning no need to adjust tying during the day. Can be used from a newborn to as long as you feel like wearing. These have a steeper learning curve than other common carriers but they are the most versatile. Woven wraps come in sizes for a variety of carries. Mesh/Gauze Wraps: (Wrapsody, BabyEtte) Somewhat stretchy and cool for summer. Many prefer to use a lightweight woven wrap when it gets hot. The mesh ones are often used in water. Less supportive for heavier babies. 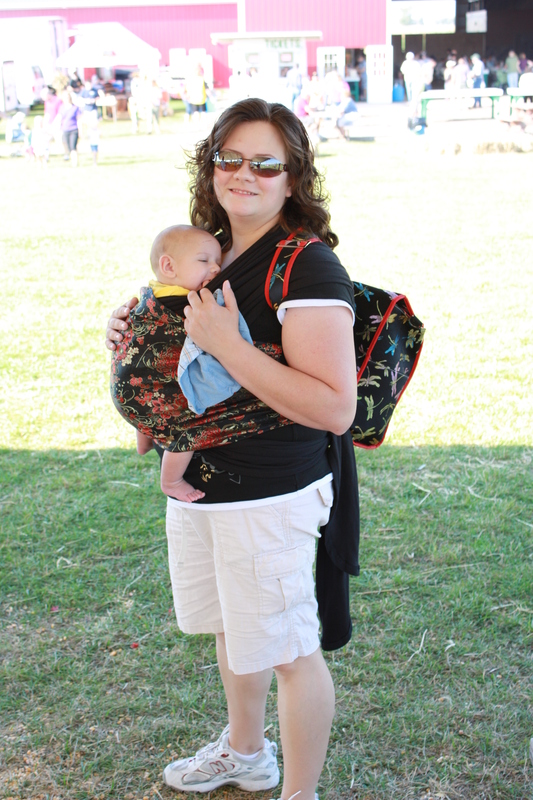 Wrap Conversions: (Didy Tai, Two Mommas Designs) These aren’t really a different type of carrier. Wrap conversions just use woven wraps as the fabric to make other carriers. Most commonly you will see unstructured carriers, soft structured carriers, and ring slings made as wrap conversions. Since these are usually custom made, wrap conversions often have many options for additional padding, different sizing, and different strap styles. This past week was about being able to celebrate. Celebrating by spreading the “love” and sharing how your life is made easier by using carriers. Celebrating through socializing, and enjoying each other’s company. Celebrating by capturing those moments on film. Celebrating and trying something new, like a ballet class with a child in tow. Celebrating with a visit to the zoo with friends, old and new. Celebrating by acknowledging how you can help make another new parent’s life easier by sharing your knowledge. We wanted to share some pics of how much fun everyone has had this fall. A lot of these photos are from this week, but not all. Some fun attendee photos at HY Photography’s photo shoot! And how about our great group and their fall shots (or favorite older shots)! There are a few shots from spectators at today’s Chicago Marathon, and a few nursing photos. Can you find them?? The normal playdate meeting that was scheduled for Friday in Mundelein is being tagged onto a playdate happening close by a bit later in the day. Sara is planning a regular playdate at Warren Township Park for 11 am on Friday morning. The location of the park is about 10 minutes north of Mundelein Playdate meeting. And to entice you further, we’re including some photos from last month’s park playdate meet up! If someone would prefer to just swap carriers in or out with Heather in Mundelein on Friday, that is also an option. Send an email to bwichicagoland@gmail.com or contact via Heather Facebook to swap carriers in Mundelein. Toddler Snuggles at the June Park Playdate! Otherwise, plan to visit Sara at Warren Township Park. Warren Park is *technically* Gurnee, but still really close for those who were planning to come to Cygnus. Enter the park on Almond Road. It is at the Southwest corner of Almond and Washington streets, and only about 10 minutes north of Cygnus Lactation. If a BWI member plans to check in our check out any carriers, please send an email to bwichicagoland@gmail.com or send Heather a facebook message through our closed group. Sara will be bringing ONE SMALL suitcase for swapping stuff out. This won’t be a regular meeting, but will be an opportunity to swap carriers in or out. It’s also an opportunity to drop off carriers that are due. We just need to know what you’re interested in by Thursday mid-day! Warren Township Park is located in the Warren Township Center (Campus), located at 17801 W. Washington Street, Gurnee, IL. 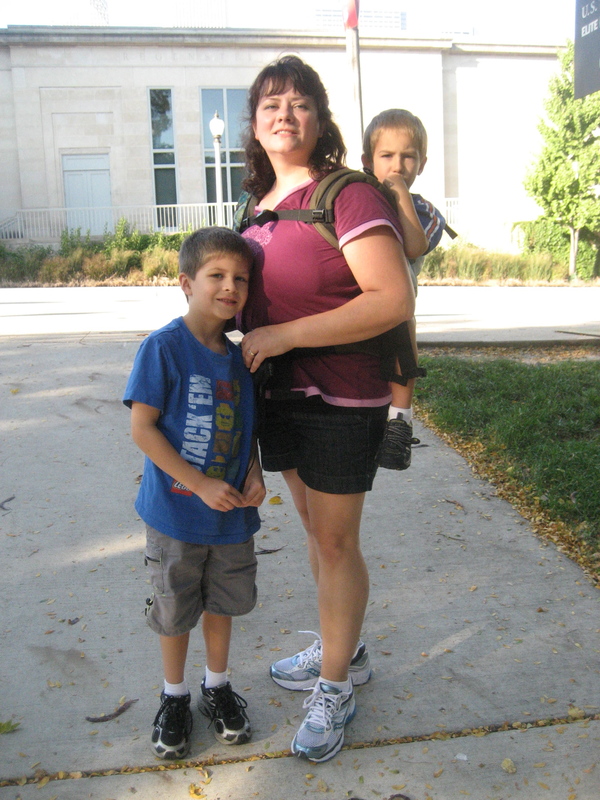 Today we want to feature a few friends who have written blog posts about their babywearing journey. We hope you read, enjoy, and comment! Susan, another member, wanted to share this guest blog post she did. Susan also works at New Mother New Baby, a local brick and mortar store that provides baby products, mama products, lactation services and classes. One of our members, Katrina, wanted to share this story directly with you. Baby wearing has always been very important to me, however it took on a whole new role when my son ( who makes babe 4) was born. Coming early into this world after a fight to keep him cooking longer. Weighing in at 4 lb 9 oz and 17 in long this tiny peanut would change everything. Wearing him in a wrap and snug to my chest almost 24/7 made the world of difference for him. It helped with his body temp and regulating his heart rate. Not to mention just the closeness feeling so good and comforting to him. As a very frequent eater I could nurse him very easy and he stayed snug and warm wrapped to me. Just as things were looking up he got very sick at 2 months and landed up at Lutheran General. With all the monitors, wearing him was not an option but I was able to fold a blanket up and “wear” him in the chair. This is also how we slept for the next week. The nurses that it was just wonderful that I fashioned a baby wrap so to speak and was able to hold him skin to skin non stop. It was truly amazing to see the difference in his stats when he was snug to me or being place in the hospital bed. I sadly encountered some not so cool nurses that thought it was best he stayed in his bed. I would watch all the monitors start to go off. He would struggle to breath and fight so hard. Soon they learned I knew what he needed and that was tight to me. Unfortunately we were back and forth 2 more times. I continued to repeat the “wrap” so to speak with a blanket and keep all his leads and wires were they needed to be but him where he needed to be the most. Now at 8 months he is much better though we continue with some things. The bond of wearing him then and now is immeasurably. At times that is the only way I get things done. I would not have done things any differently. Thank you for taking the time to read Kaenon’s story. Yea, so I know it’s my story, and I’ve posted it in parts before. But today I want to link a post that is near and dear to my heart. HERE is how our journey began. If you want to know how it ends, you’ll just have to stay tuned a little longer… The young child who was 2 in this story has somehow turned 4, and still begs to be on our backs from time to time. Do you have a story you’d like to add today? Please forward a link or story to bwichicagoland@gmail.com and we’ll add you on to this post! And don’t forget, BWI Chicagoland facebook and meeting folks- the post below is the Ergo giveaway post! Please comment and join in for your chance to win an Ergo for yourself (or a friend in need)! We get a lot of questions in our group about different types of carriers, and today I wanted to talk a little about Soft Structured Carriers (also known as SSC’s or buckle carriers). 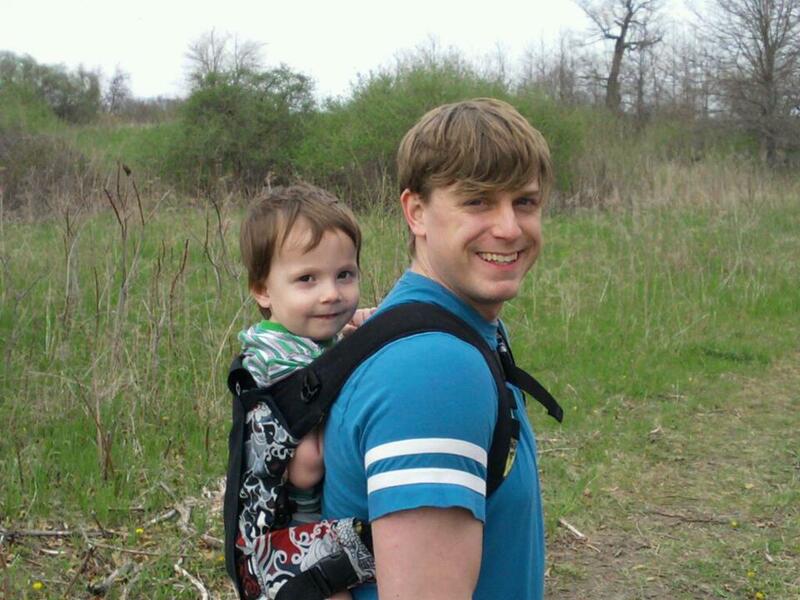 I think one of the greatest benefits for babywearing families is that SSC’s are really daddy friendly. We find they appeal to a lot of the guys who come to our meetings. I tried to get my husband to use a wrap for quite a while… and then I realized, no way, that just WASN’T going to happen. But he thought the SSC, that looked similar to his hiking backpack, was worth a try. The first time I got him into the Ergo Sport, he was hooked. I don’t think he ever looked back to the “other” carrier he had used before then. 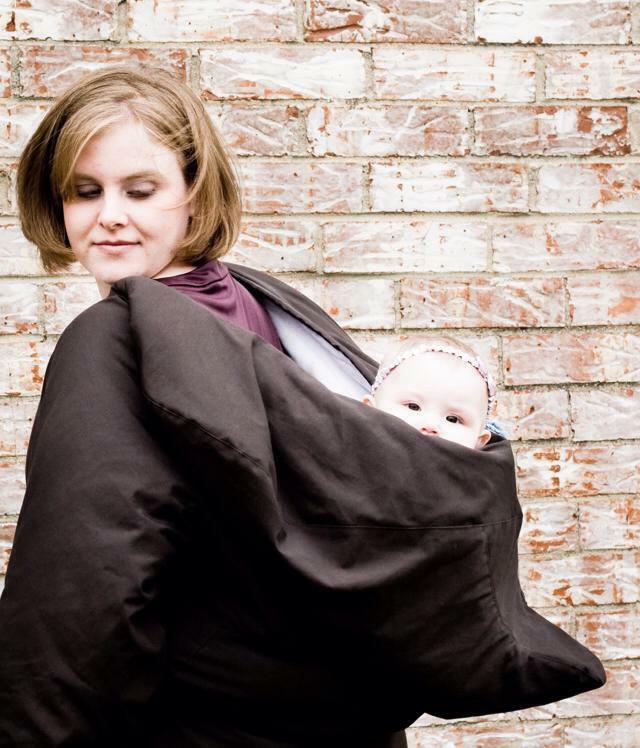 Very often, a caregiver tries on one good quality, wide based carrier (one well known brand to think of is an Ergo), likes it, buys it, and finds it suits their needs from birth through toddlerhood. But what happens if another caregiver in the house tries on the same carrier and just can’t get a good fit? What can they do then? Why would that happen? Thinking of buckle carriers and how they fit always makes me think of jeans. Not all jeans are created equal- especially post baby. Some may fit, but just feel “eeh”. Some may feel ok, but are a little tight or loose somewhere important (like the waist or tush), or too short or long. They may do the job ok, but you wouldn’t lose sleep if they suddenly got stained, ripped, or painted on by the kids. SSC’s can be the same way. For someone average height, average weight adult, with no health problems, and possibly an average bosom, the first SSC they find may fit comfortably- and they don’t need to look any further. For some folks though, it’s not love at first wear. It can be more an adventure into trial and error to find your “perfect fit”. Luckily, there are a lot of really great, easily accessible, safe brands out there that you can try until you find one you love. You can always borrow or trade among your friends (and online friends) so it’s not necessary to buy 10 SSC’s to find one you love! How the hood attaches to the carrier when in use- with a toggle, snaps, velcro, carabiner, etc. Size of the carrier body- A few brands have multiple sizes of the carrier body to wear larger children more comfortably… if the caregiver wants to try that. If you’re still looking for your “perfect fit” SSC, I encourage you to find a local babywearing group, or online support. One great resource is Babywearing International (but of course!!). Another is a popular website/forum called TheBabyWearer. Both of these sites have great resources that can help you find the buckle love. Good luck!! 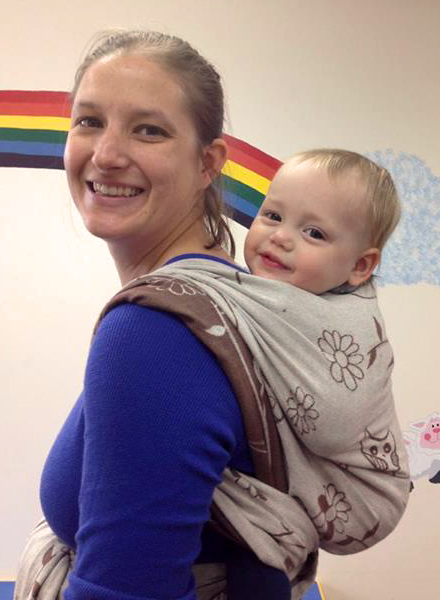 Babywearing can be an invaluable way to bond and reconnect with your little ones. Whether it’s the initial bonding with a new little squish or reconnecting after a long day of work or trip out of town, it can help ease those transitions. I just came back from a visit AWAY from my boys (the two little ones and the big one). They stayed home and fended for themselves just fine. I spent some nice adult estrogen infused time with some of my husband’s family. We had an entertaining road trip, the boys had some great bonding play time at home. It was a win-win. However, between the daylight savings time change AND my first 3 day solo adventure without K, I was kind of dreading my return. Wondering if the small bit of freedom would end up being worth it in the end, if you know what I mean. Pondering the future whiney, clingy, needy, out of control boys that I might return to. And yet again babywearing SAVED THE DAY. K is 3 now, and doesn’t get worn as much as when he was little. It’s usually because “we’re going to miss the bus” so I pop him up. Or “he’s super tired”, or “won’t stop running away”, etc. Well, yesterday it was just “because”. He asked to be worn- his idea- a few different times. And he picked which carrier he wanted and brought it to me. If he hadn’t been used to this comfort zone, as I like to call it, it could have been a REALLY ROUGH DAY. Sure, the people at gymnastics probably thought we were nuts, but that’s ok. He begged to go uppie, but of COURSE not in the back, that would have been too easy. He’s 3, average height, and a skinny 28#, so I prefer back carries or a short trip in a ring sling. 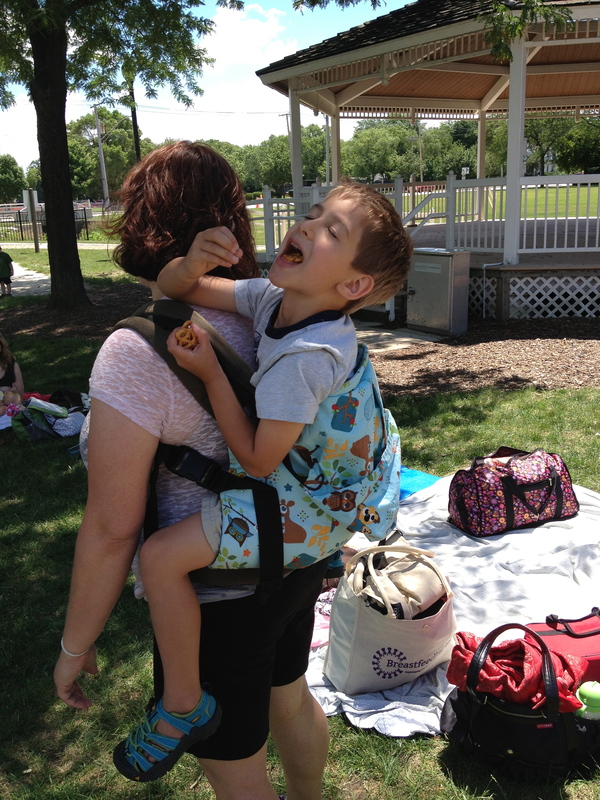 Front carries, honestly- not my favorite now that he’s a preschooler. But I obliged, and he was happy and content on my front, sucking his little thumb, playing with my hair. Close enough to kiss? Hehe, definitely not a problem. However, we’ve changed roles apparently, and I was the receiver, not the giver. It was very sweet. In the end, it’s all he apparently needed for the transition. I guess I worried for nothing. Let’s just hope and pray the next few days go as well. Oh wait, I still have my carriers, so I think it’s a definite possibility! Stay tuned for another post on the benefits of bonding with new little squishes!